We have a range of roller shutters especially for domestic use. Ideal security for your home with lightweight and compact, double skin foam filled aluminium slats for added insulation and sound deadening. You can view our prices for these shutters on our prices page. We can also supply a vented slat if you prefer, creating a balance between security, light and vision - please contact us for prices. All our domestic security shutters are made to measure and we deliver our shutters direct to your home for your own installation or you can take advantage of our UK wide installation network. Our security shutters come in standard colours of white, brown, cream or cedar woodgrain although other optional colours are available. The roller shutter box can be fitted onto the external face of your window opening or internally on the reveal or built in under the lintel. 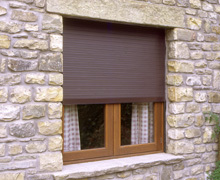 There are a choice of different types of shutter operation methods to match your budget and needs. We supply external or internal roller shutter doors. 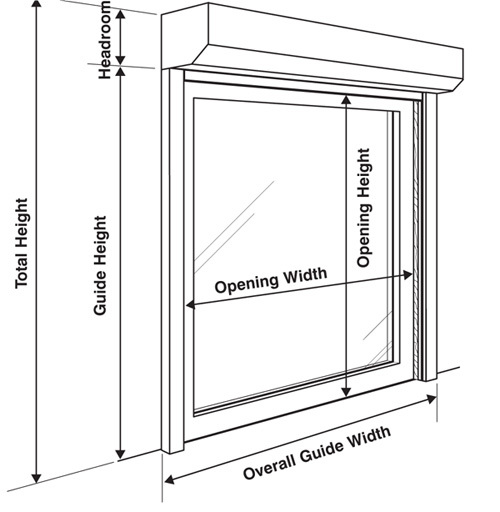 For external face fitting, measure the opening width and height. Add 60mm each side for the guide rails. This is the Overall Guide Width. The roller shutter box fits above the opening. Ensure the walls or frame can provide a secure fixing. Walls over 300mm thick will require an extension for the manual crank handle. One of the leading security companies based near Reading in Berkshire supplying DIY roller shutter doors. Bacchus House, Calleva Park, Aldermaston, Reading, Berkshire RG7 8EN. DIY roller shutters for home or business.